The pleasure of doing an exercise like this is I get to write about Disney films that are my personal favorites--the ones I enjoy (or don't enjoy) the most. It's not about dissecting which Disney films were the most groundbreaking, influential or technically accomplished. I may touch on some of those ideas as we progress, through this thirty-day experiment, but that's not my main objective. I'm just here to keep score and have some fun. That said, my favorite Disney film is Pirates of the Caribbean: The Curse of the Black Pearl. Sacrilege, you say? Out of all the classic Disney films--Snow White, Pinocchio, Fantasia--I had to choose a special-effects laden slice of Jerry Bruckheimer bombast produced nearly 40 years after Walt's death? Like I said, I chose my favorite film, not necessarily the best one. "I invoke the right of parlay." "You can keep doing that forever. The dog is never going to move." "A short drop and a sudden stop." "You are without doubt the worst pirate I've ever heard of." "This is the day you will always remember as the day you almost caught Captain Jack Sparrow." "Easy on the goods, darling." "You best start believing in ghost stories, Miss Turner. You're in one." And those are just the lines I can remember without referring to IMDB. 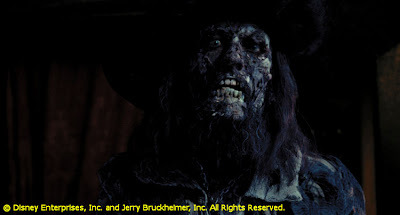 With all the marketing overkill that became the original Pirates trilogy and continues unceasingly towards May 20th's On Stranger Tides, it's easy to lose sight of how good The Curse of the Black Pearl was. This was a movie that defied the odds. In 2003, the pirate genre had long since fallen out of favor in Hollywood and--come on--the movie was based on a theme park attraction. There wasn't a whole lot of hope riding on Captain Jack and his crew. And yet...the movie was well scripted by Terry Rossio and Ted Elliott (even if the story did meander a bit in the third act) and had dazzling special effects that served the story without overwhelming it (At World's End anybody?). It had swashbuckling action, a budding screen romance between two attractive young stars (Orlando Bloom and Keira Knightley), and mostly, it had Johnny Depp as Captain Jack Sparrow, a fearless comedic performance full of tics, staggers and sways that would've ruined a lesser actor. Such an indelible character was ole' Jack, that last year Entertainment Weekly ranked him #13 on their list of the "100 Greatest Characters of the Last 20 Years." 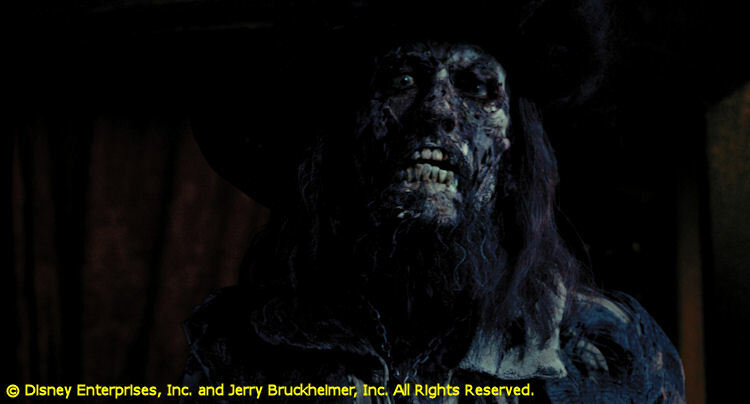 Oh yeah, POTC 1 also raked in $305 million at the box office and earned Johnny his first Oscar nomination. I'd call that icing on the cake. If it wasn't so late, I'd be popping Black Pearl in the Blu-ray player just about now. "And really bad eggs. Drink up me 'earties, yo ho!" Tomorrow: What happens when Disney gets a classic adventure story horribly wrong. My least favorite Disney film.